Tram stop on Tramlink routes 1, 2, 3, and 4. 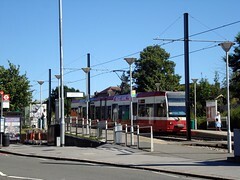 This is the point where Route 3 diverges from Route 1, Route 2, and Route 4; the line splits just to the east of Sandilands, and Route 3 heads south to Lloyd Park Tram Stop and ultimately to New Addington Tram Stop, while the other three routes head north to Addiscombe Tram Stop and beyond. Last edited 2012-06-26 11:58:35 (version 3; diff). List all versions. Page last edited 2012-06-26 11:58:35 (version 3).